The snow has been slowly thawing for over a week now, though the fields are still white and the track to my house is still impassable by car. Bare patches and large chunks of ice mean I can no longer haul up supplies on a sledge so I am using a series of packs I am testing instead. The mass of snow on the trees meant some damage was inevitable and many branches and a few whole trees had already come down before the thaw began. However the slowness of the melt and the refreezing of the wet snowpack on many nights has increased the damage. Instead of a blanket of soft snow the trees have been coated with a thick layer of heavy refrozen icy snow that has snapped branches and smashed smaller trees and shrubs to the ground. 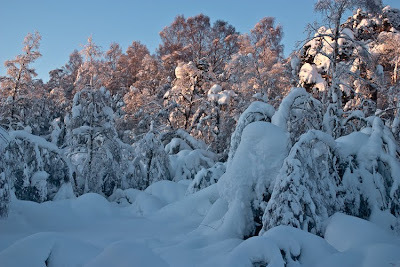 In the photograph above those mounds in the foreground are all snow-covered young birches. Many will never recover. The damage caused by rabbits and deer is now apparent too. Some small trees, including rowans and crab apples in our garden, have had two feet of bark completely stripped off. Branches that were weighed down by the snow were gnawed. Now free of their load they look very strange as the bare sections are far higher above the ground than any deer could reach, let alone a rabbit. The snow was beautiful and made the countryside magical and wild. The aftermath is not so pretty. How the natural world recovers from this will be interesting to watch. And of course there may be more snow yet this winter. A year ago there was no heavy snow until February. Our garden is very brown, even the hardier of the shrubs seems to have disliked being covered in snow for four weeks! The pond which has been iced over absolutely stinks well, I think we may have to get something to sort as the oxygenating weed seems to have died off. The Robin and Dunnock are glad to have their grubby undergrowth back though!